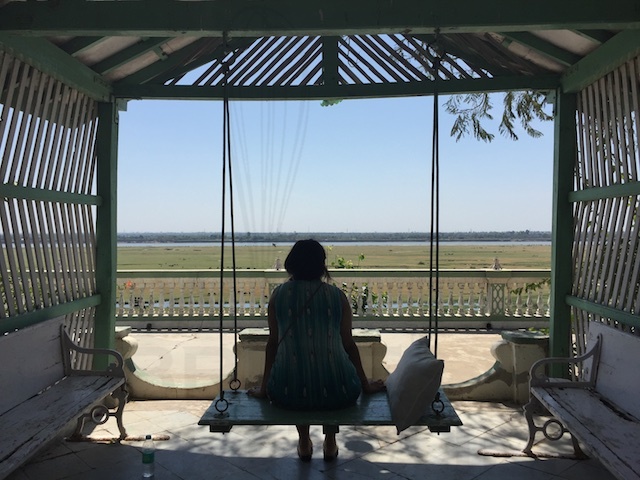 I first came across the Bharuchi Akoori when I went to Gujarat courtesy Return to Roots – a program devised to bring second generation Zoroastrian’s born overseas to India in a bid to bring them closer to their roots. 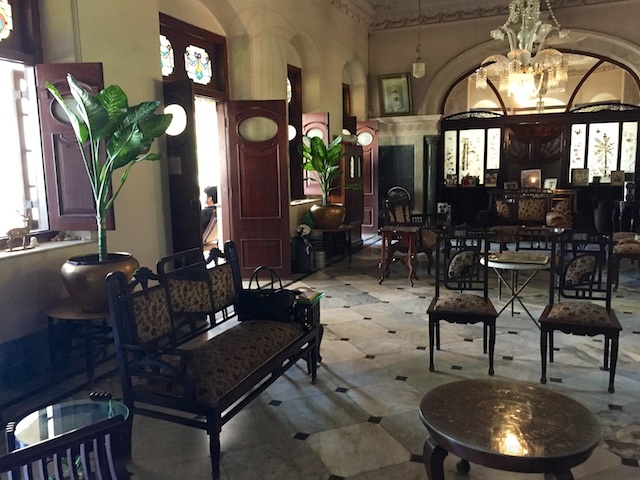 We had stopped over in the historical town of Bharuch (once the biggest sea-port in the entire world which is now sadly a quiet little town inhabited by less than 5000 people!) for lunch and I was curious to learn more about the namesake dish of the town. 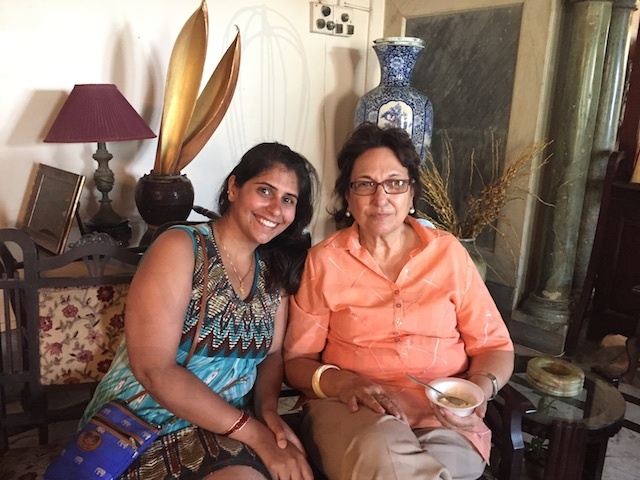 Mrs. Ginwalla whose historical bungalow we were lunching at had actually prepared some Dal Gosht for lunch to give us a break from the Parsi food overload but upon hearing my mission she took me to the kitchen to make me her version of the classic Bharuchi Akoori. If I could only use two words to describe this dish, I’d pick ‘rich’ and ‘delicious’. Ofcourse, the right way to really describe this signature Akoori is ‘Heart-Attack on a Plate’. I forgot all about the Bharuchi Akoori until I was researching classic egg dishes for a consulting project I worked on last year. 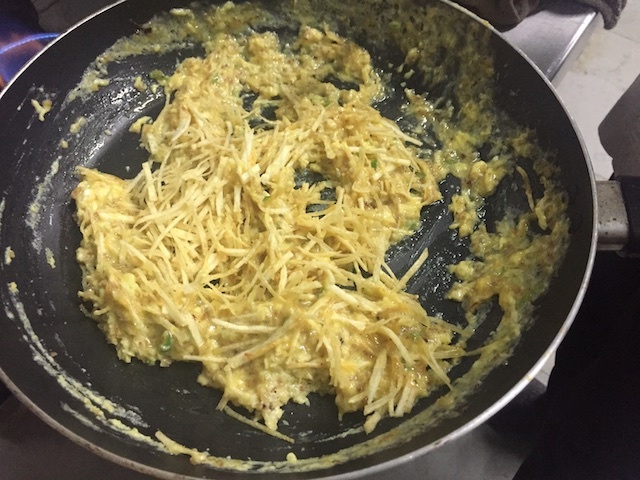 The brief was to provide a twist on the classic scrambled eggs and the first dish that came to my mind was this Akoori. 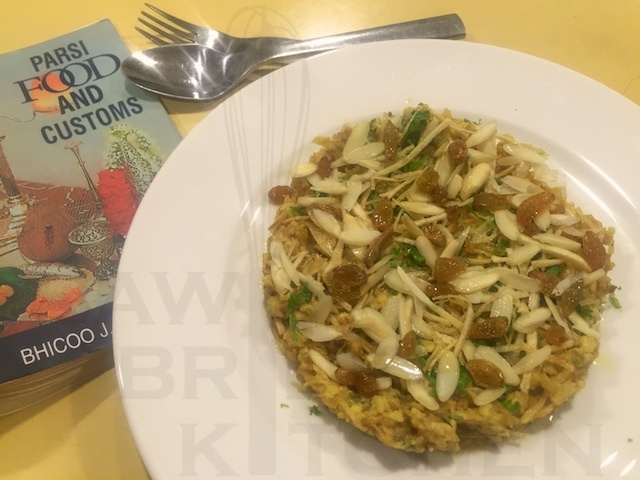 While I had Mrs. Ginwalla’s list of ingredients I didn’t have the exact quantities and so I decided to check out the traditional Parsi Food & Customs book penned by Bhicoo Maneckshaw. There, she claims that the original recipe used 600gm ghee for six people. To say I was surprised is putting it lightly! We decided to tone down the ghee from 600gm to 6 tbsp and what resulted was the best Akoori I’ve made till date. To be honest though, the Bharuchi Akoori is more a twist on the scrambled egg than an Akoori as it has hardly any masala nor does it have onions or tomato. However, the next time you’re craving a heavy breakfast, I can assure you THIS is the dish to try! To begin you require some fine Sali – potato straws. If you can’t source this from a local farsan store, I recommend making some at home. 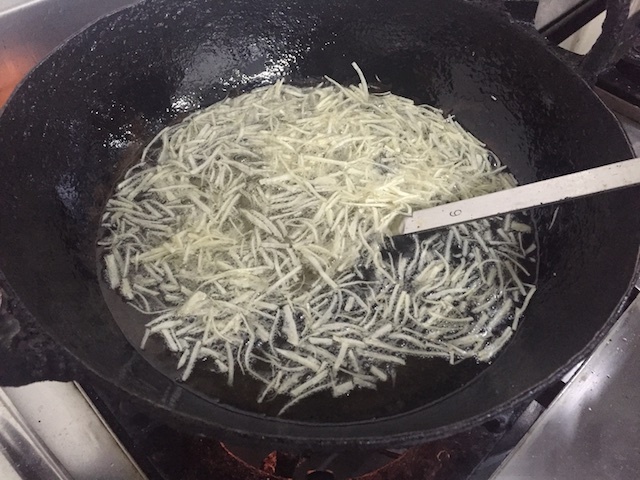 All you need to do is finely grate the potatoes and then fry it in a boiling kadhai of oil. You can bulk cook the Sali but make sure you store it in an air-tight container and don’t forget to add salt! Next, take the pan in which you’re going to cook the Bharuchi Akoori and fry the dry-fruits in the ghee. Remove the dry-fruits and next sauce the onions until they are golden brown. 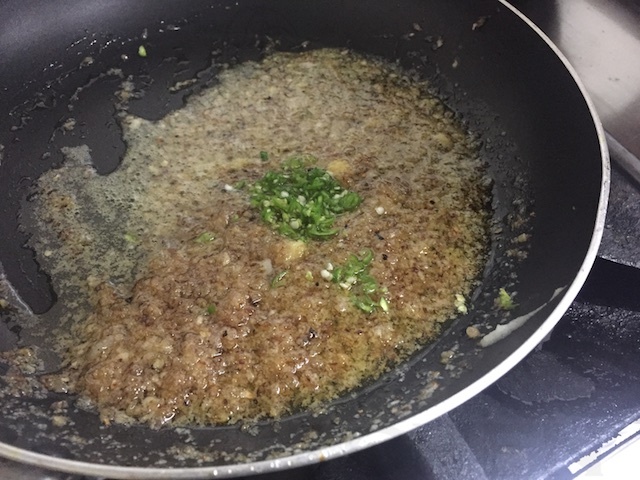 Once the onion is done, add in the green chillies as well as the ginger-garlic paste. 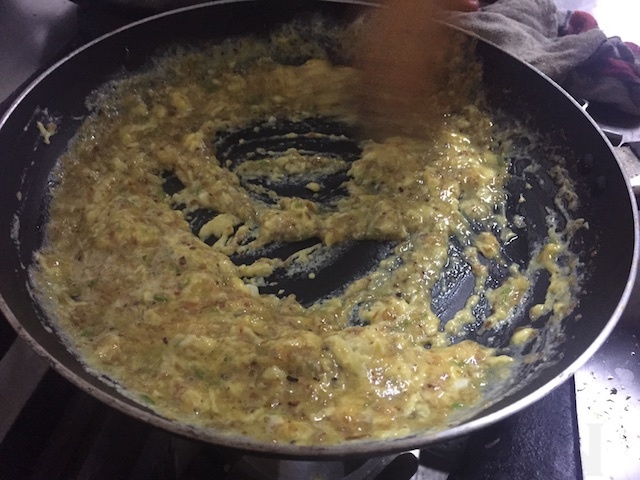 Once the masala mix is ready, whisk the eggs separately and add them into the pan in a thin stream while mixing continuously. Make sure you do not overcook the eggs – you should remove it from the flame as soon as they are half cooked as this Akoori is quite loose. Finally, add in the crispy Sali and the dry-fruits and mix gently. 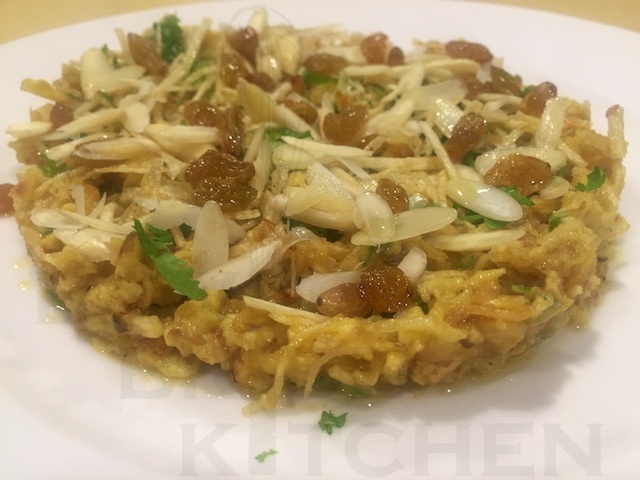 Garnish with finely chopped coriander and if you love garlic, serve it with some crusty garlic Brun!